Answering the question, “Won’t somebody please think of the children?,” Turkey may be the first country to ban Minecraft, the popular kid-pacification program enjoyed by parents and block-punching enthusiasts worldwide. The country’s Family and Social Policies Ministry, which has spent the last month investigating the Microsoft-owned game, released a report this week that called for Minecraft to be banned based on its violent content. Minecraft’s gameplay is notably varied; it ranges from players punching blocks to gather wood, to players punching blocks to gather ore, to players telling their parents long, boring dinner-table stories about all that block-punching they just did. 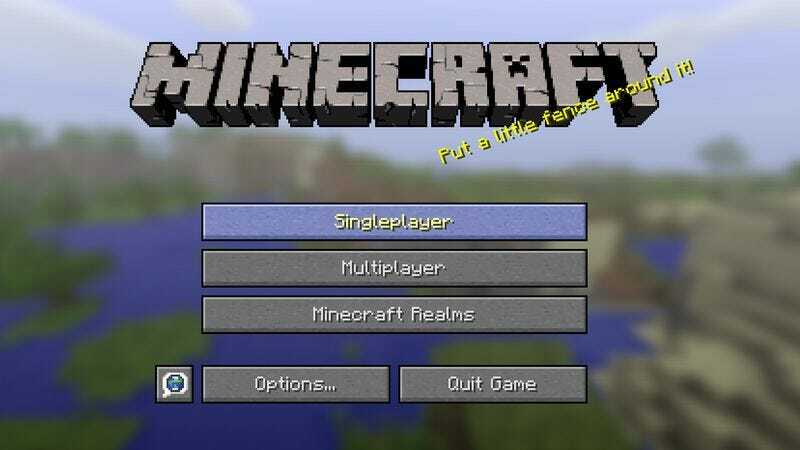 It also includes fighting monsters to protect those precious blocks, and it’s this behavior that has drawn the ire of the ministry, which concluded that, ultimately, “the game is based on violence.” The report expressed concerns that children would emulate Minecraft’s pixelated brutality, sneaking down to the family forge to use their newly-acquired blacksmithing skills to craft a diamond sword from their grandmother’s jewelry, then beating their more cube-shaped classmates to death with it. Mojang, the Swedish video game company responsible for Minecraft, has responded to the report, with a representative telling GamesBeat that the game is played in a multitude of ways by its massive player base, which also includes many adults. The representative also pointed out that Minecraft offers not just one, but two ways to play without encountering the game’s hordes of cubical zombies and spiders. The company did not go on to point out that, in terms of social health, it’s probably a lot safer these days for a kid to be a video game-warped, animal-torturing sociopath than it is for them to run around an elementary school playground without knowing what a creeper or a Herobrine are, but the subtext was definitely there.